In the spirit of brotherhood, love and oneness, the United Arab Emirates(UAE) family of the Indigenous People Of Biafra, IPOB, has accorded stanchion and abutment, to detained IPOB activists in Degema and Ahoada Prisons of Igweocha (Port-Harcourt). 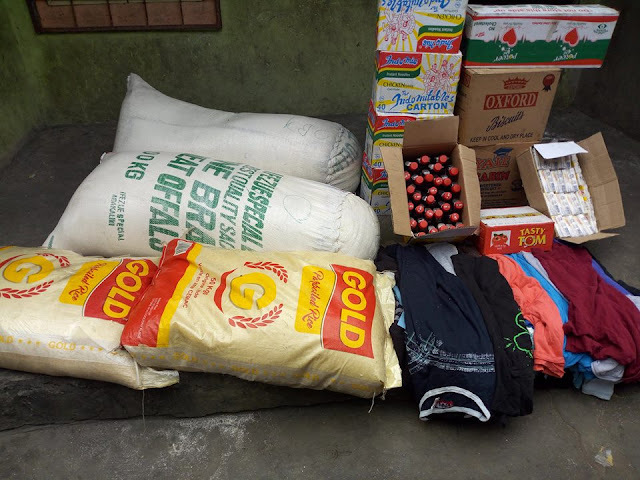 The Items include; Clothes, Bags Of Garri, Bags Of Rice, Antiseptic Soaps, Indomie, Biscuit and other Items necessary for the victim's welfare and wellbeing. This pathway of love, is unabatedly being practiced by the Indigenous People Of Biafra, following the laid out doctrine and selfless gospel propagated by Mazi Nnamdi Kanu, the IPOB leader, before his arrest and recent invasion of his residence by the Nigeria Army on the 14th of September 2017. "Onorugbe Nwane Agbaloso" (He who hears the cry of his brother, should not run away), is not just on the lips of every adherent of the Indigenous Person Of Biafra, but also being magnanimously showcased in their lifestyles. The IPOB National Coordinator of United Arab Emirates, on behalf of the UAE Family, pledged never to stop extending their support to detained IPOB activists across various Nigeria dungeons and confinements. He also, urged IPOB Families, to continue showing support in the struggle without capitulation, for it is "One For All And All For One". On behalf of IPOB United Arab Emirates, he pledged never to stop extending their love and support to detained victims in various Nigeria dungeons and confinements. The prisons went agog, on sighting the love shown to the Biafra activists, as shouts of " IPOB ONE FAMILY! ", saturated the environment. The activists however, appreciated the love and immense support shown to them, thus promised never to capitulate while being incarcerated illicitly with baseless and ungrounded charges by the Nigeria government.